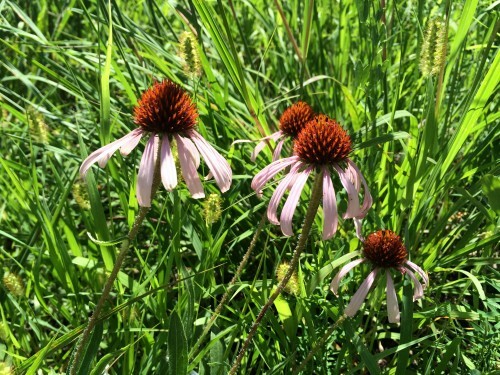 Description: In this experiment researchers on Team Echinacea investigate how variation in relatedness between parents affects progeny traits and fitness when grown in a prairie restoration environment. In 2005, team members generated seedlings of three cross types: between maternal half siblings; between parents originating from the same remnant, but not sharing a maternal parent; and between individuals from different remnants. We chose maternal parents from six remnant populations and crossed each with multiple pollen donors from the same six remnants. In 2006, seedlings germinated and grew in a greenhouse until we planted the plugs in Experimental plot 1. We assigned seedlings to randomly selected locations within the experimental plot and planted them in the spring 2006. Every summer, team members assess survival, growth, and reproductive fitness. To learn more about the beginnings of this large seedling growth experiment read this description.